As a child, I spent part of my summer days taking swimming lessons. My sister and I would walk with Jeff, the neighbor boy, to the bus that would take us to our swimming lessons in the town seven miles down the road. I did not like swimming lessons, but I enjoyed the walk to and from the bus. Jeff, Middle Gersemalina, and I would chat about the things little kids do and there was no hurry to get home, except that nagging hunger that often comes post-swimming. The past two days Brian, aka @sharrowsDC, and I have commuted home together because I happen to be spending a few days in his neck of the work woods. Our rides reminded me of those walks home after swimming lessons. Relaxed and easy, a time to unwind after hours of doing something more structured. It’s also interesting to compare our commuting ways. On a surface level, Brian is riding a Surly Ogre with 700C tires more than two inches wide, while I’m currently commuting on a small-wheeled folder, my Bike Friday Tikit. We’re both carrying luggage, but we don’t haul anything on our backs. He uses an Ortlieb pannier, and I have my Carradice trunk bag. Brian is very attuned to bike lanes and infrastructure, more so than I. I’m aware of these things, but I don’t always feel like I’m paying enough attention to them. Maybe I should? I don’t know. The bottom line is we both seek out quiet roads, whether or not they have sharrows or a bike lane. We also have identified some of the same headache spots. 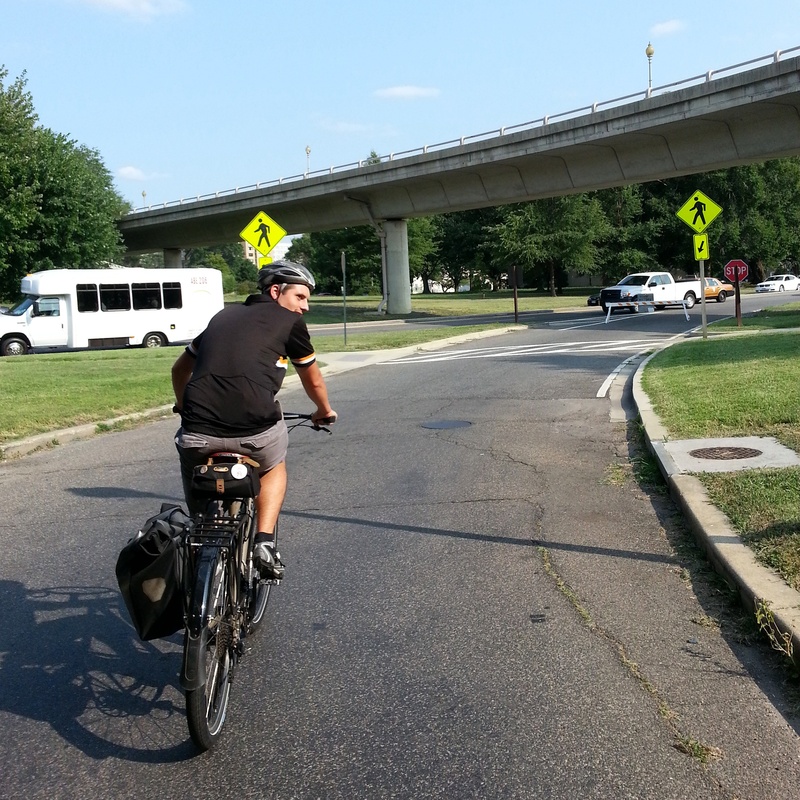 We notice similar issues about the Rock Creek Trail as we pass by the Kennedy Center. Lots of people, both cyclists and runners, and bumpy, too. We talk about the crosswalks along the National Mall, and how some of the buttons one has to push to make the lights change are not located in a spot convenient to pedestrians or cyclists. One of them is behind a fence. Not helpful. Like yesterday, we hit the double hairpin on the eastern side of the Francis Case Bridge. Both of us repeat our descents through both hairpins without putting a foot down. That makes it a true skill and not a fluke. Victory! As I ride with Brian, or anyone who commutes regularly for that matter, I notice we all have our preferred ways for getting places. Both ways are good, but I like mine best. Why? Because they are what I’m used to, I suppose. I’ve memorized every blind corner, bend, stoplight, and pothole. It feels comfortable. 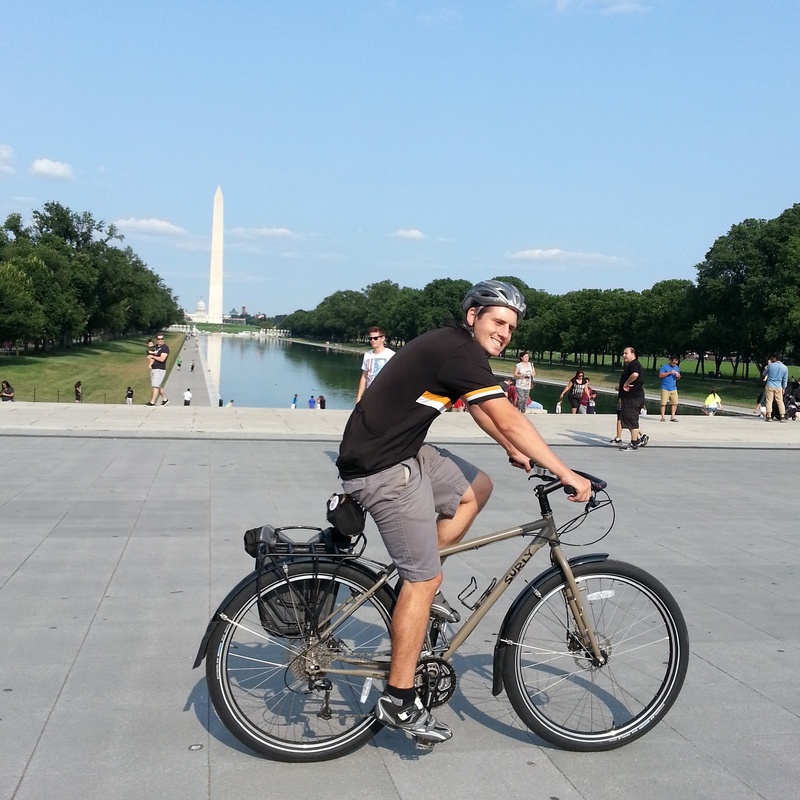 I told Brian today that riding back into downtown D.C. with him the past two days has been a simple pleasure. Yes, our bicycling is a result of our transportation choices and needs, but it’s been wonderful to combine my transportation time with a bike ride and some miles around town with a good #bikeDC friend. I am envious. This sounds like the perfect summer commute. 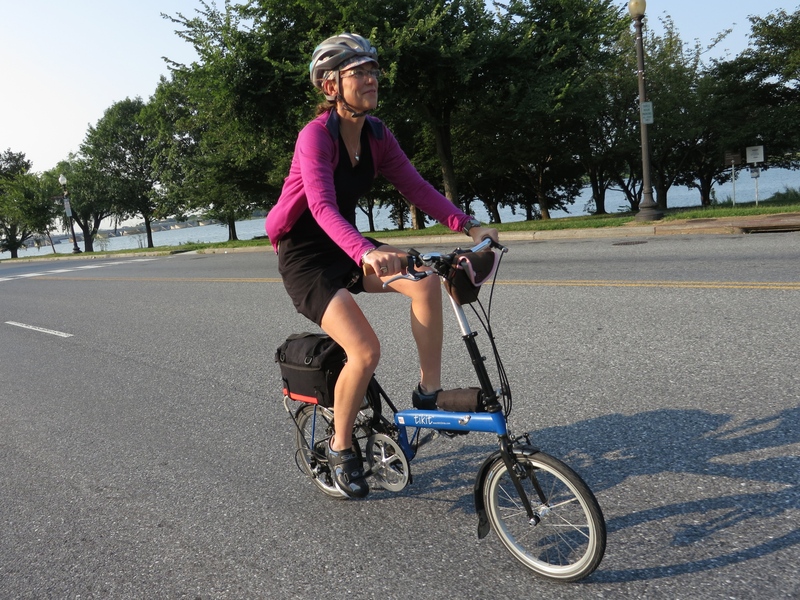 Wish I had a #bikedc friend to share my ride! Maybe I’ll work on that. So was there a big difference in speed between 700c wheels and wide tires and 16/20 inch wheels?